The Somnus Sleep Shirt may be just the thing to get you those sweet dreams you've been looking for. 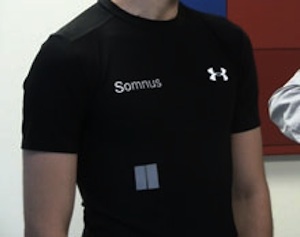 The sleep shirt is embedded with special fabric electronics to monitor breathing, and a chip in the pocket determines the phase of sleep. Besides the various statistical tools we are in the process of building, we have 2 main visual aids to help see a user's progression throughout the night. On the top we have our Sleep Depth Chart. 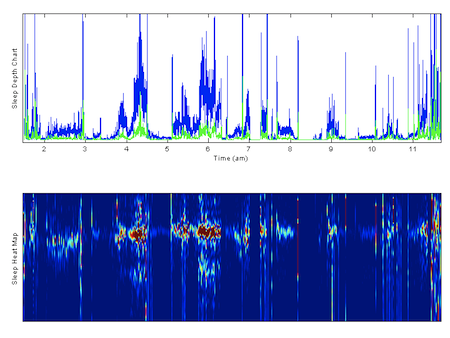 The difference between the blue and green traces shows how deep into sleep a user is. As the two traces separate and the blue trace rises, the user is falling deeper into sleep. Secondly we have our Sleep Heat Map. Here a user can quickly glance at a night's data and see how he or she slept. When an area looks random or messy, the user is awake. A tight, narrow block of bright color indicates a deeper sleeping period. Darker red color shows deeper sleep. Darker blue washed out areas show periods of REM sleep. If there is a bright tall band, this usually indicates a short wake up during sleep. The company hopes to have a commercial product available by summer of 2012 for less than $100. Take a look at the hearthsirt from Wetware (1988) by Rudy Rucker for an sfnal predecessor to this proposed product. From Nyx Devices via Technology Review.